The Scenic Ridge Cabin is a unique, hexagon shaped cabin with a rustic exterior and decor. 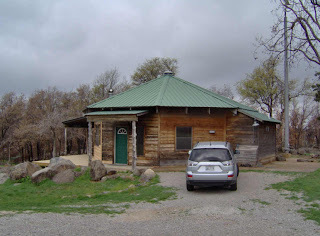 It is located just north of the Wichita Mountains Wildlife Refuge and is a great location for exploring the area. We stayed here on a spring vacation and had a wonderful time. If you are looking to explore the mountains just north of Lawton, Oklahoma, and you are looking for a cabin to rent in the Wichita Mountains then this is a good choice and has great views of Mount Sheridan from the front porch or living room. The link above has many pictures from our recent trip. Enjoy!